Blogging really has it’s perks, I won’t lie about it. You meet inspirational people, make new friends and if you are really lucky, your postman brings you a big box of crisps – crisps that aren’t only terribly tasty, but also healthier than others. He brings you a box of Walkers Mighty Lights. * Walkers’ latest ridged crisp does not contain any artificial colours or preservatives. * They are available in three flavours: lightly salted, cheese & onion and roast chicken, with all flavours suitable for vegetarians. 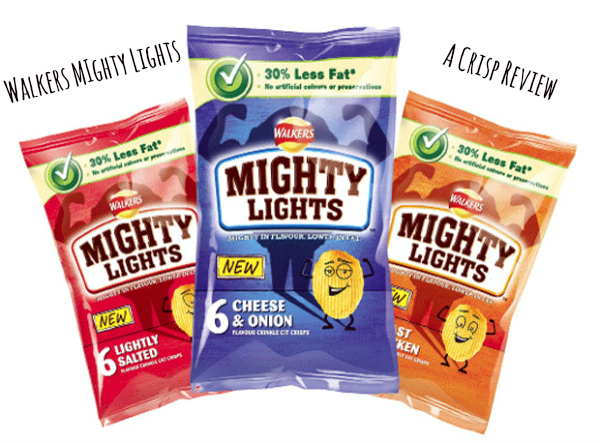 * Walkers Mighty Lights contain 30% less fat than average crisps. So what did we think about the Walkers Mighty Lights? Ben and Amy are massive crisp fans, whereas I am the one with the sweet tooth in our family, so when they discovered that we had been sent a massive box full of crisps, there was no holding them back. They opened a bag from each multi pack, snuggled up on the sofa and started their big taste test. Their winner was the cheese & onion flavour. No surprise there for me as that’s the flavour they always go for. Ben described them as light and crispy (he’s got such a thing with words), but he didn’t notice that they contained any less fat than other crisp brands. He did however highlight that the lack of fat did not mean a lack of flavour. The bag was gone as quick as any other and the two of them quickly reached for another one. Personally, I am not too keen on crisps. I do eat them occasionally, but when I fell pregnant with Amy, I really went off them. I did however try some of the new Walkers Mighty Lights as, obviously, I can’t write about something on the blog or even recommend it without having tried it myself. Not being a fan of cheese & onion crisps (I always find that the cheese flavour is a little overpowering), I picked the lightly salted and roast chicken flavour and they were really pleasant in taste and texture. They had a nice crunch to them, the ridge made them a little different from their original Walkers brothers and sisters and the fact that they are a little more healthy than standard crisps made me eat them feeling a little less guilty about my cheeky treat. I can’t judge, if they are any better or worse than any other brand as I simply don’t eat enough crisps to be a fair judge, but the fact that Walkers Mighty Lights have 30% less fat than other crisps makes me consider them more than other brands. They make a great snack on long car journeys or a picnic and are the perfect size for a lunch box treat. Disclosure: We were sent 3 multipacks and were compensated for this review. Is that 114 calories, and how does that compare to other brands of crisps? I think you can get other bags of crisps for 80/90 calories. Crisps are so tempting, but as I diabetic I try to resist now.